How can I be added into the members of Github/Openkore ?? Once we have your username, any of the project admins can add you as a developer to the project. But you don't even need to be an official developer to the project to contribute on GitHub. Anyone can make a fork of the project in their own account, make commits, and then submit a pull request to be approved in the official repo. My github account is "snop222" !! Ok !! Now I got a fork from the Openkore project. After my own commit, and create a pull request to the official repo. But Now !! How to re-checkout from the official project into my fork ? Also, I've added you to the GitHub organization as a developer, check your email for confirmation. Now that you have commit access, you can make your own branch in the main project repo and submit pull requests that way (instead of using a fork, if you prefer). Hey there, I checked out your changes and everything looks good. Your pull request was merged into the main project. Yes !! I Got it !! So now, I can directly commit to the the official project, can't I ? But now I have not codes need to commit. I will keep this in my mind for next committing !! I still don't well understand the GitHub user interface, I will do more effort on it. Just like you said "... to checkout your forked code from ..."
In other words, I can keep my own version with this fork without merging from the official project. I found the revison number is different between my frok and the official repo !! But I can not find the "Merge pull request" function as your captured image, where is it ?? You'll probably want to spend some time learning how git works, there are a lot of great resources out there including the official Git documentation and YouTube tutorials. I sent you that screenshot because it explains the steps required for someone to take the master openkore branch and apply your patch for testing. Did you test these changes in game before merging them? The point of making pull requests is so that developers can review and test changes before they are incorporated into the main project. Ah, Sorry !! Very Sorry !! I think I had a mistake !! I make wrong merging on main project !! Could it to be rollbacked ?? I just want to try the "Merge Pull Request". I will be more careful, before I well understnad the GitHub works !! 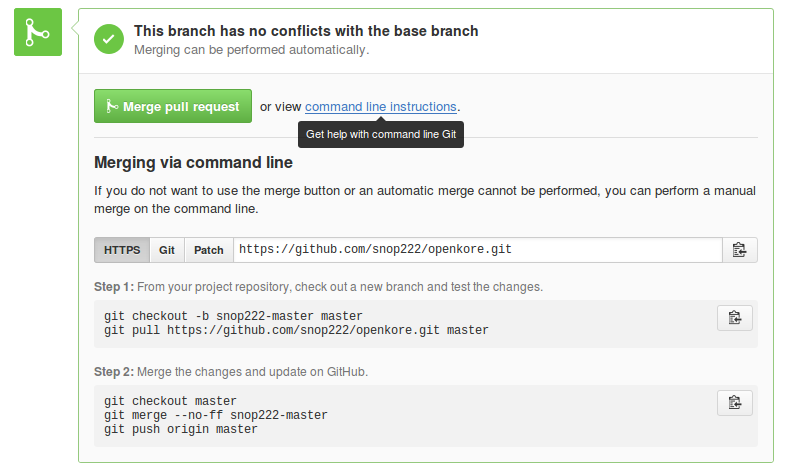 PS: I think, I do only one "Merge", but merging two "Pull Request" ! !